KoopaTV: Maya Fey: From Spirit Medium to Spirit Battle! By LUDWIG VON KOOPA - What the Maya Fey Spirit Battle would be like in Super Smash Bros. Ultimate. To celebrate and express just how excited we are about Phoenix Wright being confirmed as the second Challenger Pack in the Super Smash Bros. Ultimate Fighter Pass, each week between now and when Phoenix Wright is released in-game we will come up with a new idea for a Spirit Battle using a character from the Ace Attorney series! Interpret the fight like this. Your character and Maya Fey are both on Wuhu Island's bridge, analogous to the very recent Dusky Bridge incident on Eagle Mountain. That featured Maya Fey being stranded inside the Inner Temple after the bridge connecting the Inner Temple to the rest of the world collapsed (sending Phoenix Wright to the hospital). Maya is trying to focus on spirit channeling, being the Phantom special attack. Part of the training to master the Kurain Channeling Technique is being able to channel several different spirits in succession, which is what the Phantom summoning is. However, she's distracted by the occasional item spawn. In the Japanese version of Super Smash Bros. Ultimate, all Food items that appear are Spaghetti—the closest Food dish to Maya's favourite food, ramen noodles. In the localised versions of Super Smash Bros. Ultimate, the Hamburger dish will be the only food that spawns instead, since Maya's favourite food in those are burgers. That makes the fight slightly different between regions, because Spaghetti heals 8% damage while the Hamburger only heals 7%. After defeating Maya, she'll support you as a Spirit, like her role as an assistant to Phoenix Wright. True to the Kurain Channeling Technique, her ability is increased transformation duration. Those who are more experienced in the technique can channel a spirit for a longer period of time. Maya Fey attempting to gain the spiritual power necessary to be the Master of the Fey clan. 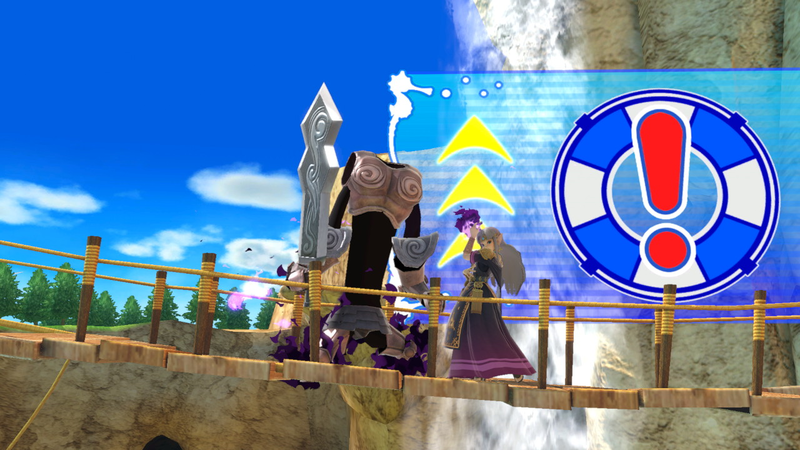 The Wuhu Island bridge is a dangerous place to be, but Maya can be a pretty reckless girl! Ludwig hopes that you appreciate this Spirit Battle idea and will look forward to the continuation of this weekly series! The staff has plenty of developed ideas for these, so don't worry about inspiration. But if you'd like to share your own ideas in the comments section or your requests, feel free. Do you think that this idea for Maya Fey's Spirit Battle makes sense? Or if you could make it, would you have a much different take? The first Spirit Battle written by KoopaTV was for Rawk Hawk. The next Spirit Battle in the Ace Attorney series is for Franziska von Karma. Increasing the duration of transformation effects, which I take to include growth, shrinking, metal form, and I'm sure there's others I've forgotten, seems like a very interesting ability, one I wish was in the actual game. I'd totally combine that ability with a spirit that lets you start as metal form and save it as one of my favorite loadouts. By the way, you are familiar with the events of the latest game, Spirit of Justice, yes? It's quite a game changer for Maya. Including King of Hyrule, Sudowoodo, Hungry Luma, Prince of Sablé, and Model ZX. It is?! I guess somehow I never got any of those spirits. None of them sound familiar as Spirit Battles that I actually took part in. It's not that they sound familiar as Spirit Battles, but they should sound familiar as usable Spirits after the battle is over. Well to me, there is a complete overlap between those two traits. I don't use the Spirit Board and I don't craft spirits that can't be fought in World of Light. And when I start a new file I get rid of all the spirits I collected. It's how I like to play. I just started my New Game+ of World of Light. Doing it just for the Challenge Board achievements. Playing it through as Ludwig until the end where I gotta use Ganondorf...!